Feile na Tuaithe festival takes place in the National Museum of Ireland – Country Life, Co. Mayo on May 24-25. The Féile has attractions, demonstrations and events to suit everyone from three to 93 and it’s all completely free of charge. The festival begins the moment visitors walk inside the Museum gates with attractions, displays, demonstrations and stalls throughout the extensive grounds. 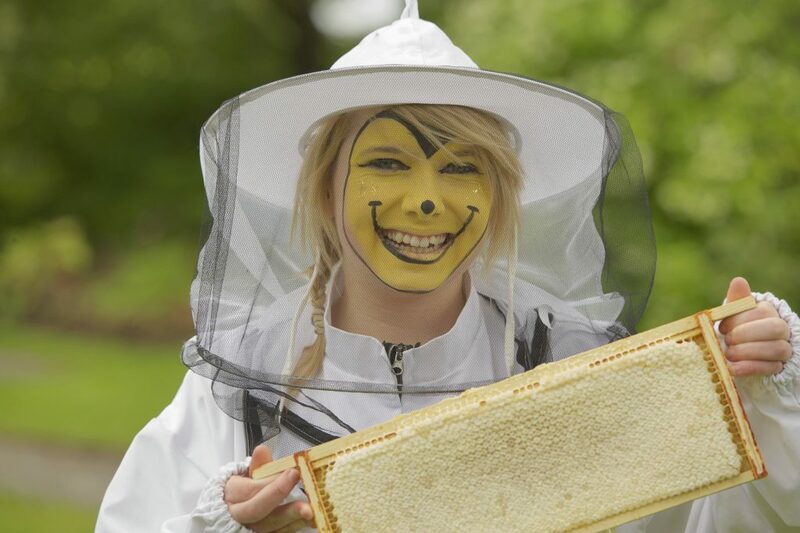 See working gundogs fling themselves into the lake with joyful abandon, watch busy bees at work with Beekeeping Clubs and discover how to attract bees, butterflies and other pollinators into your own garden. Listen to live music from contemporary to traditional – and join in The Music Circle if you’re brave enough! See hurling in action, and have a go yourself – then compare the today’s sliotar with hair hurling balls our ancestors used. Take a look at a thatcher and threshers at work. Watch a wood turner, weaver and a wool dyer display their craft. See strawcraft, make harvest knots and step it out with sean nós dancing. Visit a traditional traveller’s barrel top wagon and learn bushcraft skills from an expert. Cast off with the knitting circle and scuttle along the Scarecrow Trail. Inspired by the Museum collection, OnSight have created wonderful installations throughout the grounds on the theme of Traditional Farmhouse Fare. If that works up an appetite, find your way to the two food areas. Food is a central focus of Féile na Tuaithe 2014, with dozens of stalls featuring premium quality artisan fare from the region. As well as delicious samples, tempting fare will be on sale, both to enjoy at Féile and to bring home. The Museum cafe is open too and has both indoor and outdoor seating. New this year is a series of food-themed talks in the Museum Galleries and a Meet the Makers section for both food and craft producers. The Museum and Galleries remain open during Féile and everyone is welcome to enjoy the folklife collection and take part in the Féile Quiz.